Home > The Bottom Line > A Price War Coming for Satcom IoT? A Price War Coming for Satcom IoT? Satcom IoT is going from strength to strength, and not showing any signs of stopping, with NSR expecting growth to continue over the coming decade across a wide range of applications. However, on the horizon are many competing IoT network deployments that promise to significantly lower the cost of hardware and airtime costs associated with IoT and to open new markets. Given these new cut-price alternatives, where does that leave existing M2M operators, which have a higher cost base and higher service price? New competition in this space includes the rise of small satellite constellations for IoT (despite some questionable business cases), Low Power Wide Area (LPWA) networks, and 5G connectivity, which is just around the corner. These new smallsat operators and LPWA networks intend to offer ARPUs of $1 per month, or even just a few euros per year. Low prices are also available on the terrestrial side, with Unabiz also announcing offerings as low as $1 per year. Sigfox even demonstrated a 20 cent terminal, which could bring in a new large market of disposable devices and tracking packages. Sigfox even wants the module cost to be 5 cents in 10 years from now. By comparison, Iridium’s commercial IoT service ARPU was an order of magnitude higher at $13 per month in 2017, compared to $18 in 2012, indicating a decline in ARPU. However, the price elasticity here, and increasing awareness of IoT and M2M in general, resulted in a year-over-year increase of subscribers of 26% in Q3 2018. Other satellite operators have similarly much higher commercial IoT ARPUs compared to smallsats. Will mass price cuts be unveiled once smallsat IoT constellations and LPWA networks are fully rolled out? Customers will be tempted by these lower-priced options, and even more so (in absolute terms) on the terminal side. However, this is not until high value customers discover the potentially long latency times for smallsat constellations, lower SLAs, and reduced flexibility on offerings that are available. Further, these low prices are for very specific use cases, in many cases providing service for less than 1 data packet per day – acceptable for some niche applications, but not for customers who want more premium services. High value applications in maritime, land transport, energy, gov/mil and many more will continue to rely on full-featured M2M constellations for a long time to come. Use cases here (such as automation in the energy markets, safety, emergency alerts and vehicle telematics) require more than a few bytes per data packet and/or require low latency. Thus, service for these use cases cannot generally be replicated on LPWA networks or IoT focused smallsat constellations, resulting in (mostly) distinct market segments between MSS and smallsats. By comparison, the target market for smallsat constellations includes fishing aggregation devices (buoys), basic device location tracking, and for use on consumer fishing and leisure vessels. This distinction between the two is further demonstrated by Iridium signing an MoU with Hiber to collaborate on market opportunities, offering complimentary services that could even grow Iridium’s revenues. Similar MoUs have been established with other operators. Like-for-like ARPUs will remain significantly higher than smallsats and terrestrial competitors, but taking into account MoUs and dual mode connectivity, overall satcom ARPUs will be lower. With dual-mode services, least cost routing can be implemented to reduce costs to customers utilizing both cellular 5G and satellite connectivity, and because ARPU from service providers is ‘blended’, there will only be a marginal cost difference for end-users to utilize satellite when outside of terrestrial network areas. Satcom IoT operators can thus be expected to pick up a large number of ‘occasional use’ IoT users, dragging down ARPUs significantly, but greatly boosting the number of overall terminals ‘touching’ the satcom network, resulting in net gains to the bottom line. While a strategy of purposely lowering ARPUs can certainly boost demand by acquiring more price-sensitive customers, this is not the only strategy. Globalstar by comparison, raised the price of its rate plans lately, and consequently saw ARPU for its SPOT products increase from $11.69 to $13.25 monthly throughout 2017, during which time the company also saw a 5% growth in SPOT subscribers. Orbcomm, through its string of acquisitions, also provides increasingly compelling product offerings to its customer base, and consequently has seen its subscriber base grow 17.5% throughout 2017 with no signs of ARPU sliding. This leads to a growing retail revenue base amounting to $2.6 billion in 2027 driven by MSS satellites, and demonstrates that by offering compelling products, increasing ARPU, subscribers, and service revenue can go hand-in-hand. 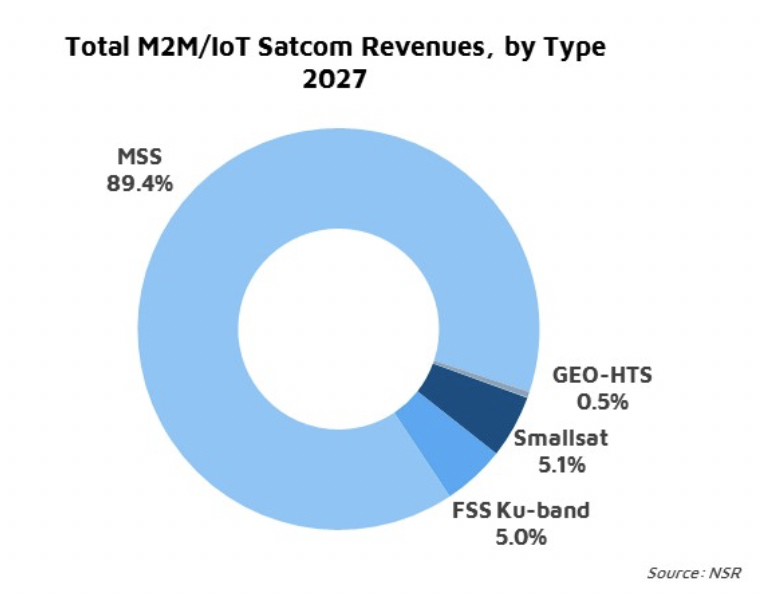 By offering compelling products for satcom IoT and M2M more generally, traditional MSS operators can continue to demand premiums well above what LPWA networks and smallsat operators are charging for services. This class of operators can provide significant value in terms of security, reliability, single global network, and other value-added offerings and customer support. Because of this, NSR expects there will be limited large scale price cuts (and an averted price war), to compete with new types of IoT connectivity, permitting revenue streams from established and highly valuable customers to continue to grow well into the future.